A squad of armed men manage to remove the Professor from his lab before he’s mauled to death by Weapon X. However, he doesn’t escape unscathed – his hand has been sliced off! He’s intercepted by Doctor Abraham Cornelius, and they run off to hide in the Adamantium Reactor Hold along with Hines. The Professor commands Cornelius to shoot Weapon X’s power supply, which would shut him down. He reveals that Weapon X is currently in the control of someone else – but he won’t reveal who. Meanwhile, Weapon X has decimated the squad of men and cut the power to the Adamantium Reactor’s turbines. As the Reactor begins to overheat, Weapon X breaks through and comes face to face with the Professor. 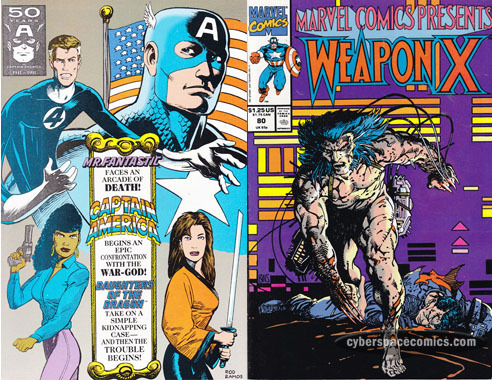 Captain America comes to (after his gassing last issue by Mora) and takes on Wargod’s men. After he gets through them, he comes face to face with Wargod but, he’s got Senator Weason and General Hager at his mercy – trapped within a glass case hooked to lethal gas. It’s up to Cap to defeat Wargod before the villain can kill the captives. And, as the battle draws to a close, the villain’s helmet is knocked off … revealing Mora, the General’s daughter. Ant-Man‘s been called in to defuse a bomb planted by terrorists. Shrinking down to ant-size, he’s able to get inside the bomb to disconnect the wires. Unfortunately, he steps on a floor failsafe and, if he shifts his weight off, it’ll trigger the bomb! So, he enlists the aid of some local ants to get out of the jam. Tony and Bruno have been hired to intimidate Audrey and her Gra’ma to leave their home. They’re the only two remaining in a tenant building that the owner wants to demolish. Gra’ma believes herself to be a powerful witch – so, later that night she casts a spell to summon a demon to protect her and her granddaughter from the enforcers. When Daredevil shows up to save the day, she’s still convinced that her magic worked and that DD is the demon she summoned to protect her. The mystery of who the Professor is working with continues as the Weapon X action heats up. Ditko’s Cap tale concluded and I’m still quite confused by the motivation of all these characters. Too much exposition and too many new characters … only 16 pages. It just didn’t work for me. Although, I must point out that Ditko’s artwork actually looks decent here, enhanced by Terry Austin’s inking. It was nice to see the spotlight shine on Ant-Man II (Scott Lang) – a character who doesn’t get much solo limelight. It was a fun, small-scale adventure with wonderful artwork. The Daredevil story had a fun hook … but, at the same time, it kind of makes you feel bad for the senile old woman. It’s kind of cool when a story can inspired two conflicting emotions like that. In the 1980s, Catherine Yronwode served as Editor-in-Chief of Eclipse Comics. Her tenure as EIC brought forth such notable works as Alan Moore’s Miracleman, Dave Stevens’ the Rocketeer and Scott McCloud’s Zot! After Eclipse went bankrupt, she worked in Claypool Comics’ production department. 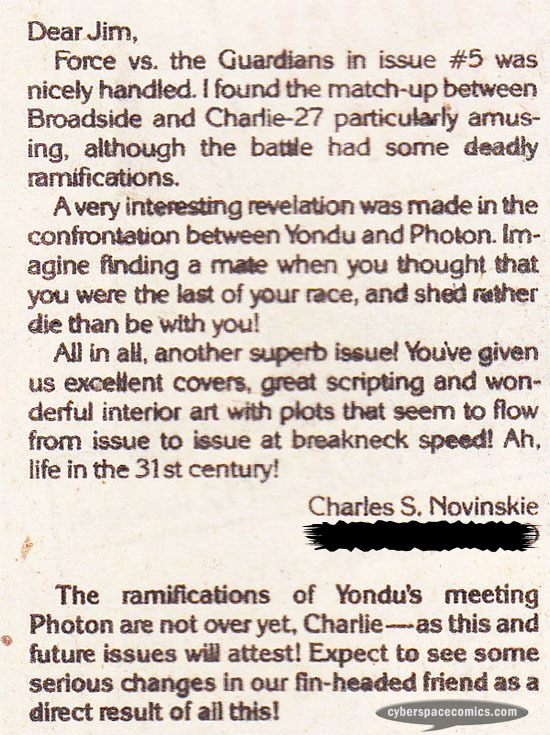 She got a letter printed in Micronauts #5 (cover date: May 1979), expressing her pleasant surprise in enjoying the series which was based on a line of toys (and therefore, could have easily been uninteresting). 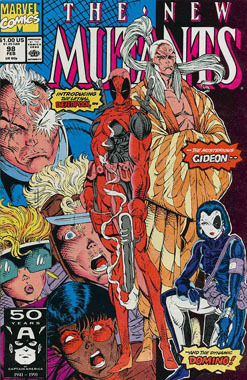 Deadpool famously debuted in the New Mutants #98. 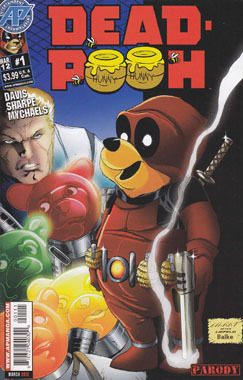 21 years later, Antarctic Press asked: What do you get when you cross Deadpool with Winnie the Pooh? 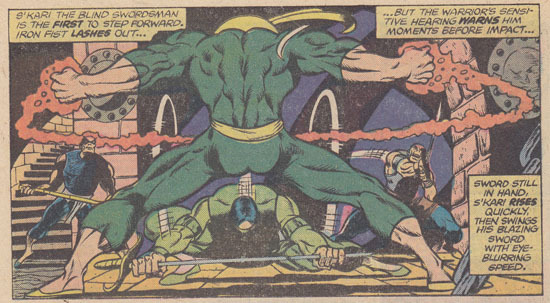 Iron Fist– As a young boy, Daniel Rand discovered the mystical city of K’un-L’un. There, he trained in the martial arts and acquired the power of the Iron Fist, which allows him to focus his chi and enhance his strength and speed. The Thing is knocked out with an anesthesia ray at Shea Stadium and yanked into the sky by Queen Sen’s men. They bring him aboard their blimp and place him with their other captive, Iron Fist. The two heroes are dropped from the aircraft into a jungle – the men let them know that they’ve been brought there to train an army so they may defeat General Chonga (who has captured Queen Sen). The men figure that if their army can defeat the martial arts master and the monster, then they are ready to challenge General Chonga’s army. 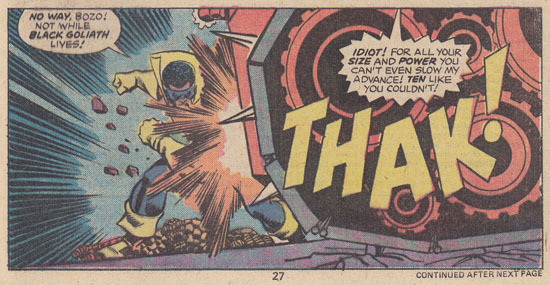 An initial grouping of men attack Iron Fist and the Thing but they’re quickly defeated. They reveal the location of their base and the two heroes make their way to the Temple at the Ridge of Four Hells after a long trek. Within the temple, they’re attacked by S’kari the blind swordsman and Mongo the Merciless. But, the battle is quickly stopped by Prince Dragon who reveals that his Queen Sen was to marry the emperor of a nearby nation to arrange peace between the two lands. But, General Chonga defected, took his army with him and kidnapped the Queen before the marriage could take place. 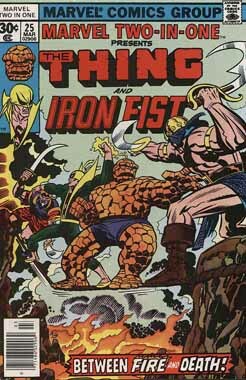 Now that Iron Fist and the Thing know the story behind why they were kidnapped, they decide to join Prince Dragon in liberating the Queen so that peace can be forged through marriage. The majority of this story takes place on Kaiwann, an island off the coast of Manchuria. This is the first and only appearance of General Chonga. WHY is Iron Fist the guest-lead? When this issue was published, Iron Fist’s series wasn’t selling very well. His appearance here was probably intended to draw some attention to his own series but, it didn’t work out. That series was cancelled six months later. This was the first issue of Marv Wolfman’s run but it wasn’t all that gripping. It started off well with some nice character bits between the Thing and Alicia. But, it quickly got silly when the thing was blasted with an “anesthesia ray” and hoisted into the air by two metal hooks stuck in his jacket. Are we really to believe that his jacket wouldn’t tear from his 500lb. weight? Aside from that, pitting the Thing against some regular guys with martial arts backgrounds is a completely unfair battle. And, because of that, the fight scenes don’t last very long. On the plus side, there are some twists and turns to this story (all of which have not been revealed here) that tug at some emotions. 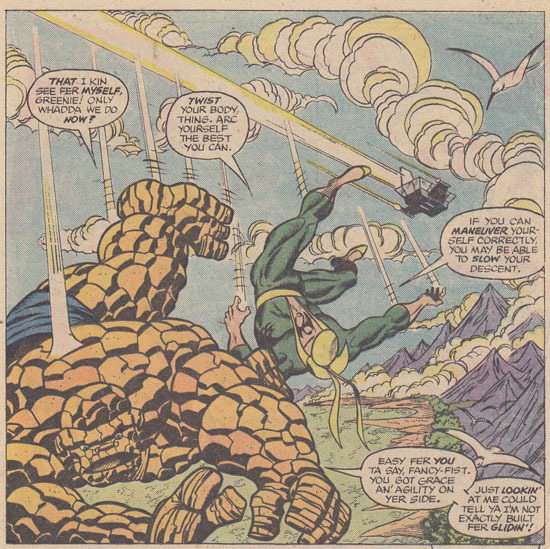 And the interaction between the Thing and Iron Fist is fun for Thing fans (let’s just say he doesn’t treat IF with the greatest respect). So, all in all it wasn’t terrible but I wouldn’t recommend it strongly. Note: This issue’s letters column features commentary on Marvel Two-In-One #22. Weapon X is on the loose and neither Doctor Abraham Cornelius nor the Professor can get him back under control. As the situation spirals out of control, it appears the Professor is reporting the trouble to some unknown person. Meanwhile, Weapon X continues to make his way toward the Professor’s lab – it appears that he knows exactly where his target is. By the end of the issue, the Professor is savagely attacked by Weapon X.
Captain America answers an urgent call from Jake Bage, semi-retired FBI officer. When he gets to Jake’s apartment, he discovers the agent’s dead body and is attacked by the killer, Wargod. The villain overpowers Cap and tosses him out a window. By the time our hero can make his way back to the apartment, Wargod has made his escape – but not before he destroyed some mysterious files. At the apartment, Cap discovers a recording by Jake that explains some leads about Wargod. It leads him to seek out Agent X-4, who is timely attacked by a squad of masked goons. 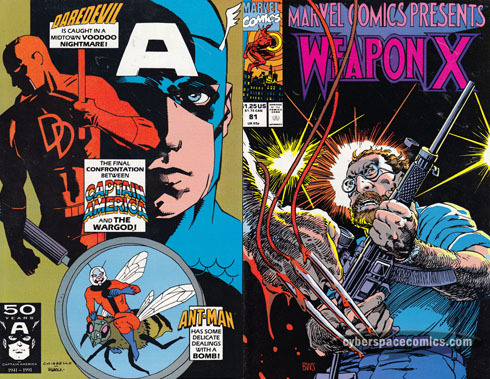 Later, Captain America follows up on a lead that X-4 discovered, and meets up with the now-resigned General Hager. After the meeting, the General’s daughter, Mora, renders Cap unconscious with a dose of gas! It appears that she’s one of Wargod’s aides. Mr. and Mrs. Peters have hired the Daughters of the Dragon to find their missing daughter, Shana. A little girl calling herself Tok leads them to where the kidnappers are. After some daring maneuvers, the girls manage to incapacitate all four goons … but the missing girl is nowhere to be found. Nowhere, that is, until her parents show up and we find out that “Tok” is just Shana’s nickname! Somehow, the little girl managed to break free and then lead the Daughters of the Dragon to the kidnappers (without revealing that she was, indeed, the kidnapped child). Mr. Fantastic is trying to analyze the Thing’s hide in order to get a fix on its DNA structure. After days of laboring on it with no results, he decides to take a walk in hopes of clearing his thoughts. He decides to wander into an arcade where he ends up playing Flight to the Stars and racks up the high score with ease. But, the locals don’t take kindly to an outsider coming in and breaking their record, so the gang jumps him! In the ensuing battle, an arcade machine is busted up and a supply of cocaine, that was hiding inside, is revealed! Mr. Fantastic subdues all of the drug-dealing villains and, in the end, befriends the neighborhood boy whose record he just beat. The two of them strike up a friendship and head to another arcade to battle it out over high scores. This chapter reveals a new thread to the Weapon X storyline: just who is the Professor working with … or for? Ditko’s Captain America story seems somewhat political … but I’m not really sure what he’s driving at yet. The Daughters of the Dragon tale was a bit of a stretch – just how could that girl break free from four armed thugs? Finally, the Mr. Fantastic story was nothing special until the last page where he has a bonding moment with a talented youth who has given up on school. Charles S. Novinskie served as Topps Comics’ sales and promotions manager. 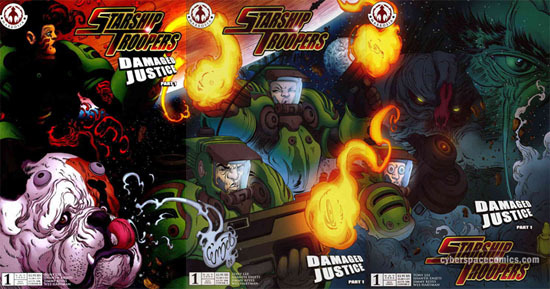 He’s written articles for Comics Interview and Star Wars Galaxy Magazine. Novinskie was also the editor on Overstreet’s Fan magazine and Topps’ Duckman series. 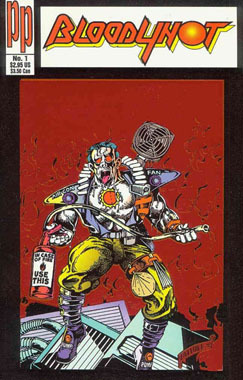 He got a letter printed in the Guardians of the Galaxy #8 (cover date – January 1991). 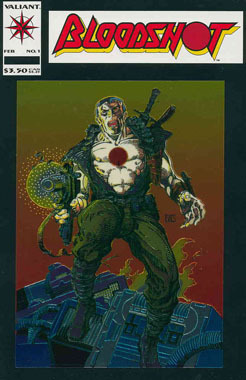 Bloodshot was one of Valiant’s all new creations that starred in his own rather successful ongoing series. ValiantFans.com estimates that this issue had a print run of 850,000! So, it stands to reason that Parody Press would jump on board with a spoof that very same year. Consider, if Parody sold just 5% of the 850K, they’d sell over 40,000 comics! Not a bad venture…. Black Goliath – After acquiring Doctor Pym’s size-changing formula, Dr. William Foster usd the formula on himself to become a super-hero. Black Goliath can grow to a height of fifteen feet and his strength increases with his size. The Thing is assisting Stark Industries West with an experiment led by their scientist, Dr. William Foster. Foster has devised an “atmosphere suit” that will protect future astronauts as they explore the atmospheres of other planets. With the experiment in progress, the scientists are ambushed by the Hijacker. The villain assumes the Thing is trapped within the atmospheric chamber while the scientists have been gassed – so he heads off to find valuable Stark technology that he can pilfer. Little does the Hijacker know but, the Thing has managed to break free of the chamber and one of the scientists, Dr. William Foster, was not affected by the gas. 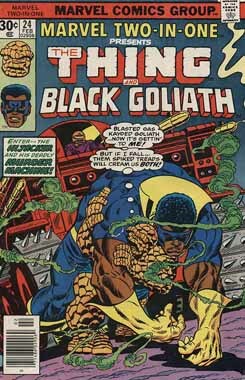 The Thing leaves Foster behind as he looks to track down the Hijacker, little knowing that the scientist is secretly Black Goliath. Soon after the Thing engages the Hijacker, he’s joined by the 15′ tall hero. And, despite the Hijacker living up to his name (hijacking the experimental Stark weapons and using them against the two heroes), he’s eventually defeated, ruining his robbery plan. The Los Angeles, California branch of Stark Industries. The Hijacker will be back in Marvel Two-In-One #96. WHY is Black Goliath the guest-lead? Black Goliath’s series was cancelled with issue #5 (cover date: November 1976 | Retro-Read Review of Black Goliath). In February 1977, this issue of MTIO hit the stands at the same time that Black Goliath was becoming a part-time member of the Champions. Mantlo was the writer of the Champions at this point, so it seems that this issue was intended to grab a little more attention for the character that would hopefully translate into sales on the other title. Since this was Bill Mantlo’s last issue as writer, I was hoping he would go out with a bang. Unfortunately, that wasn’t the case. This was a rather simple, beat-em-up tale with very little characterization. I was also disappointed to see that the villain used in this Black Goliath tale was an old Ant-Man villain. Now, I realize that he’s a derivative hero … but that doesn’t mean has to get stuck fighting all of his predecessor’s villains, too. Note: This issue’s letters column features commentary on Marvel Two-In-One #21.